Communicating expectations for school performance is important, but ratings will only get us so far unless they are accompanied by meaningful action to improve. Once a school is identified as needing improvement, school and district leaders, families, and community members must figure out what to do to better serve all students. Many of the important decisions about how to support schools to improve — such as which literacy programs to offer, how to provide high-quality professional development to teachers, and the kinds of health and community services students need — will be made by districts and schools. But states make a number of key decisions that can either support — or derail — the school improvement process, including setting reasonable timelines, streamlining planning requirements, deploying improvement dollars fairly and effectively, and providing clear and consistent guidance. The success of recent improvement efforts has been, at best, mixed. Often, school improvement processes were set up in a way that actually made progress harder. Instead of a single plan, schools often had to submit multiple plans. Often, schools were required to start making changes as soon as they were identified as needing improvement, with little time to actually understand their challenges or engage their full communities in planning how to fix them. Rather than identifying the underlying causes of underperformance, school leaders often focused on low test performance itself as the cause. With money to spend, school leaders tended to jump to a solution — a new program or training package — before fully understanding the problems to be solved. And when improvement dollars ran out after a designated number of years, schools hit a massive funding cliff from the sudden loss of resources. As states revise their accountability and improvement systems to comply with the Every Student Succeeds Act, advocates must push states to learn from past experiences and make decisions that maximize the likelihood that school and district leaders will be successful in their task of improving underperforming schools. Diagnose. The school improvement process should begin with a meaningful needs assessment — a systematic process for understanding the underlying school- and district-based causes of underperformance. Plan. The school should work with its district to develop strategies to address the challenges identified in the needs assessment. Instead of multiple plans for different federal and state programs, there should be a single improvement plan that specifies the actions the school will take, what kinds of supports and resources (if any) the school needs, and who will do what. There should also be agreed upon benchmarks for how much improvement the school expects to see each year. Implement. 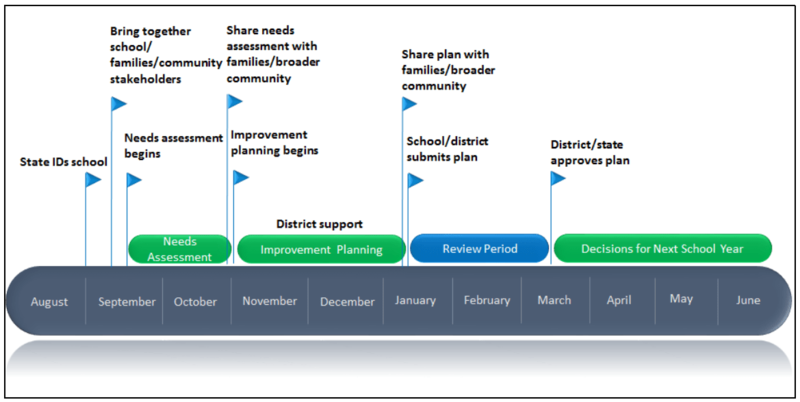 The school should implement the strategies in the improvement plan, with ongoing support from the district and/or state. Monitor. The district and state should monitor the progress the school is making using the benchmarks set out in the school’s improvement plan. Intensify Action. If the school fails to improve within a reasonable timeframe, the state or district should require additional action and support. What does ESSA require in regard to the improvement process? Under ESSA, most decisions about school improvement are left up to the states and districts. But the law requires certain types of schools to take action if they are identified as needing improvement. The lowest performing schools(bottom 5 percent and high schools with low graduation rates) must work with their district to submit an improvement plan to the state. The law specifies that the plan must address resource inequities. The state sets “exit criteria” (levels of performance they have to reach to no longer be identified in this category) for these schools. If the school fails to meet these criteria within four years, the state has to require additional action. Schools where one or more groups of students are consistently underperforming must submit an improvement plan to the district. If the school fails to improve within a district>determined number of years, the district has to require additional action. Schools that have one or more groups of students whose performance would place them in the bottom 5 percent of Title I schools must submit to the district an improvement plan. The law specifies that the plan must address resource inequities. The state must set “exit criteria” for these schools, and if they don’t meet these criteria in a state-determined number of years, the state must treat them like the lowest performing (bottom 5 percent) schools. For all three types of schools, schools and districts have to show that the strategies they propose to use are evidence-based. In addition to about $13 billion in general Title I funds, which can — and should — be used to support improvement efforts, there is about 1 billion set aside specifically for school improvement. ESSA specifies that when distributing these school improvement funds, the state should give priority to districts that serve the most schools in need of support and improvement, demonstrate the greatest need, and demonstrate the strongest commitment to improving student achievement and student outcomes. The success of the school improvement process depends on the will and capacity of the people in the schools and districts who do the hard work of school improvement, as well as the support of their communities. But states have several levers for supporting or encouraging schools and districts to engage in a coherent process that improves achievement for all groups of students. Ensure that the improvement process begins with a meaningful needs assessment. Achievement data can signal that a school isn’t doing well, but a meaningful needs assessment engages the full school community in examining a range of other information to help understand why. Looking honestly at things like school leadership, the quality of instruction, or the health of school climate isn’t always easy. It can be even harder to look honestly at inequities within a school in access to experienced teachers or high>level courses. This information, however, is essential for helping educators and leaders pinpoint where to direct resources and support. To encourage schools to take an honest look at differences in how schools are serving groups of students, states should provide a statewide needs assessment tool or template that asks not just general quality questions but ones that are focused on equity (see Figure 3). Instruction What percentage of students enroll and succeed in advanced coursework? How do rates of participation and success in advanced courses differ by student group? Professional Development To what extent do professional development offerings model research-based strategies to support student learning? To what extent does the school offer opportunities for staff to build the skills and knowledge needed to support students with disabilities or English learners? School Climate What percentage of students are suspended at least once in a school year? Are some groups of students more likely to be suspended than their peers? Which groups? This kind of thorough examination may require looking at data well beyond those available on the school’s official “report card,” including whether the school has adequate resources compared with other schools in the district or how satisfied families are with the frequency and quality of information they get on how their children are doing. In addition to a needs assessment template, states should provide schools with the data or data collection tools necessary to examine potential causes of underperformance. Provide benchmarks for progress on key indicators. These plans also should be clear about how teachers, families, community members, and students are engaged in the planning process. Establish ambitious but attainable exit criteria. States must determine whether schools have improved sufficiently to no longer be identified as low performing. States should set high expectations by requiring schools to do more than just get out of the bottom 5 percent or improve the performance of a group of students for one year. Instead, the criteria for sufficient improvement should be meeting goals for all groups of students or reaching a significantly higher accountability rating (e.g., moving from an F to a C) for at least two years. Use school improvement funds strategically to provide resources to schools that need them most. ESSA includes approximately $1 billion in school improvement funds, and states have considerable discretion in spending those dollars. But those are by no means the only resources that schools identified for improvement can use to support their improvement plans. The vast majority of those schools receive Title I and Title II funds, for example. And most have other federal dollars, virtually all of which can — and should — be deployed as necessary to implement the top priorities in school improvement plans. In determining how best to distribute their additional school improvement dollars, state leaders should consider both whether and how those funds might support the needs assessment and planning phase, and what level of support is necessary for implementation and monitoring. They will also want to consider conditioning successive years of funding on a demonstration of real progress on both plan implementation and leading indicators of student performance. And to prevent schools from experiencing massive funding cliffs when the term for additional improvement dollars is over, states may want to taper that funding in later years and require the school and district to include a budget demonstrating how necessary activities will be covered from other federal and/or state and local funds.